Also serving communities of Green Valley, Manito, Hopedale, Farmington, Havana. There are 8 Assisted Living Facilities in the Pekin area, with 4 in Pekin and 4 nearby. The average cost of assisted living in Pekin is $3,100 per month. This is lower than the national median of $3,346. To help you with your search, browse the 19 reviews below for assisted living facilities in Pekin. On average, consumers rate assisted living in Pekin 4.1 out of 5 stars. Better rated regions include East Peoria with an average rating of 4.4 out of 5 stars. Caring.com has helped 5 families in Pekin find high-quality senior care. To speak with one of our Family Advisors about assisted living options and costs in Pekin, call (855) 863-8283. In Pekin, 16.5 percent of the population consists of seniors age 65 or older. To ensure their needs are met, a total of 18 assisted living facilities are in Pekin and an additional 14 facilities are in nearby cities such as East Peoria. Assisted living facilities are known as assisted living and shared housing establishments in Title 77, Part 295 of Illinois' Administrative Code, which regulates assisted living facilities. Pekin is part of the Peoria metropolitan area in central Illinois. January is the coldest month in this area, with an average low of 17 degrees Fahrenheit and average high of 33 degrees Fahrenheit. July is typically the warmest month, with an average low of 66 degrees Fahrenheit and average high of 86 degrees Fahrenheit. The overall cost of living in Pekin is 7 percent lower than the national average for the United States. The highest relative expenses are transportation and utilities, which are respectively three percent above and one percent below the national average. The lowest relative expense in Pekin is housing, which is about 32 percent below the national average. Pekin has a higher than average crime rate and is only safer than 26 percent of all cities in the United States. The annual rate of violent crime in Pekin is 4.21 per thousand people, compared to an annual rate of 4.36 per thousand people for Illinois. In comparison, the annual crime rate for the entire United States is 4.0 per thousand people. The Greater Peoria Mass Transit District provides public transportation for the Peoria metropolitan area, including Pekin. The fare for senior citizens over the age of 65 and those is half of the standard fare. Discounted fares require an ID card or Medicare card. The Miller Senior Citizens Center serves the needs of older adults Pekin. Recreational activities include Bible study, bingo, art classes, swimming and walking. This senior center also organizes community events such as collection drives for aluminum cans and glass bottles. The Pekin area is home to world-class medical facilities, including Pekin Memorial Hospital and Methodist Medical Center. Assisted Living costs in Pekin start around $3,100 per month on average, while the nationwide average cost of assisted living is $4,000 per month, according to the latest figures from Genworth’s Cost of Care Survey. It’s important to note that assisted living rates in Pekin and the surrounding suburbs can vary widely based on factors such as location, the level of care needed, apartment size and the types of amenities offered at each community. 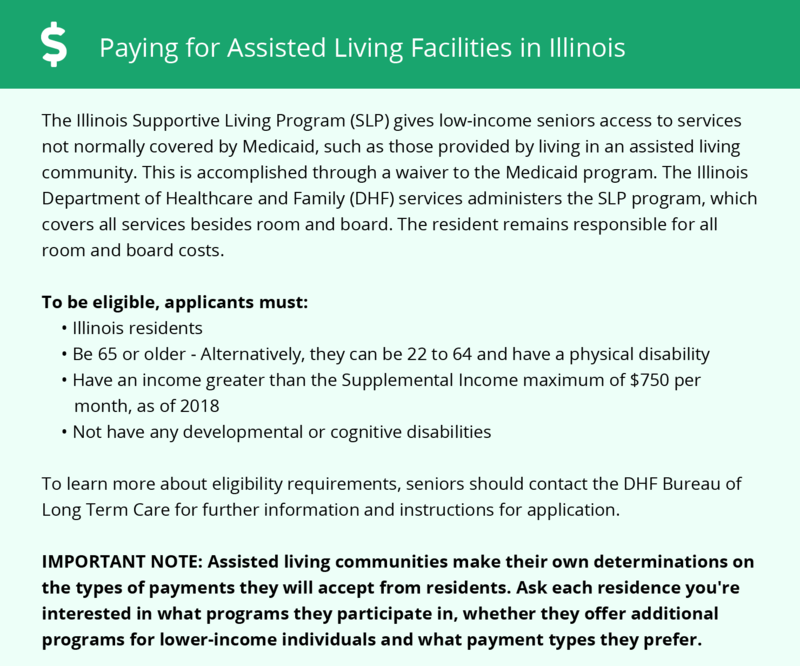 Illinois' Medicaid program doesn't cover the cost of assisted living, but the state does have an optional state supplement (OSS) program for seniors in need of financial assistance. Pekin and the surrounding area are home to numerous government agencies and non-profit organizations offering help for seniors searching for or currently residing in an assisted living community. These organizations can also provide assistance in a number of other eldercare services such as geriatric care management, elder law advice, estate planning, finding home care and health and wellness programs. To see a list of free assisted living resources in Pekin, please visit our Assisted Living in Illinois page. Pekin-area assisted living communities must adhere to the comprehensive set of state laws and regulations that all assisted living communities in Illinois are required to follow. Visit our Assisted Living in Illinois page for more information about these laws.